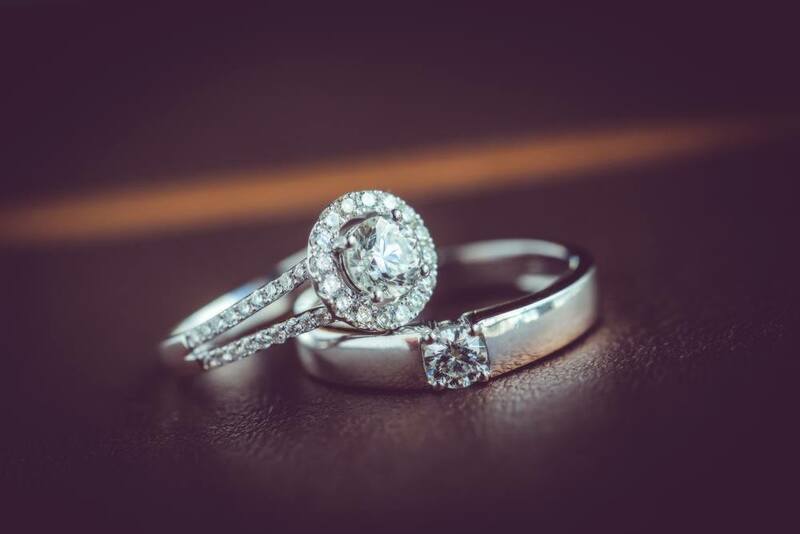 Traditionally the engagement rings get the attention, standing as the sparkling centerpiece on the left hand, while the wedding ring is much more simply styled. Since the two rings are often worn as a dazzling duo, though, many brides want their wedding band to complement their engagement ring. Some couples choose to buy their engagement and wedding rings together, but for most, wedding ring shopping takes place closer to the wedding itself. Use this guide to find what wedding band styles and designs will pair well with your engagement ring and create your own dazzling wedding set. If your engagement ring features a contemporary flat band or a thinner band like the ring pictured above, choose a wedding band that offers a similar width and depth. With flat banded engagement rings, avoid chunkier channel set wedding bands. Why? When diamonds are channel set, they need to be secured in a thicker band. 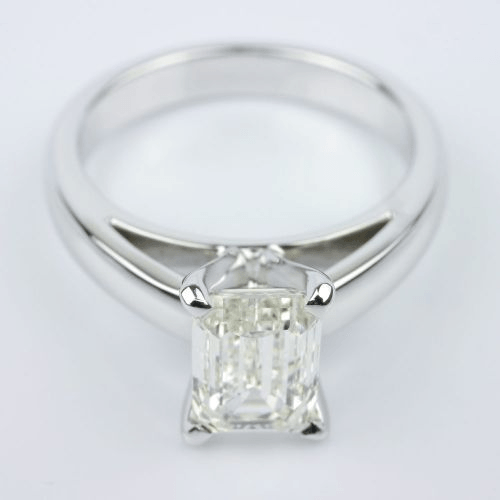 This more hefty setting will stick out above a flat or thinner banded style engagement ring, and the two rings won’t have that optimal seamless appearance. Even if you like to mix styles, the width and height difference between the ring and band can easily make them uncomfortable to wear together. Instead, select a flat or thin comfort fit wedding band to seal your vows. If you want dazzle, seek out a setting that features delicate pave stones or a detailed inlay, like opal, mother of pearl, a complementary metal, or even meteorite. An engagement ring that sparkles with multitudes of diamonds or gemstones, or particularly large stones like the five diamond ring above, already commands attention. If you really want a wedding band with lots of diamonds, keep the look consistent by choosing diamond cuts that match the diamonds in the engagement ring. 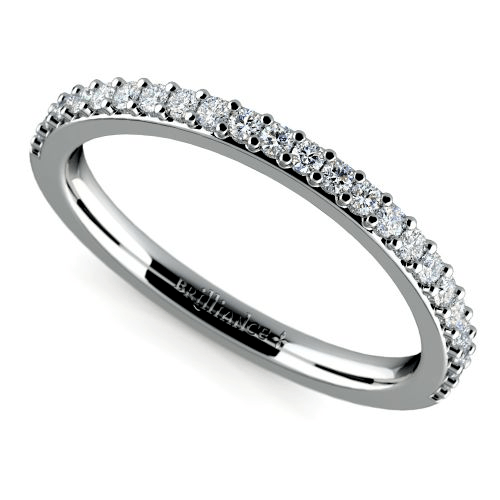 You also can select a simple band with tiny pave set diamonds for a simple twinkle. To add depth to a dazzling diamond engagement ring, opt for a wedding band that features colored gemstones. The halo style engagement ring is gorgeous, but you might find yourself wondering what band will pair well with the stately halo. Fear not! There are wedding bands that were specifically designed to nudge against the curve of the halo for a seamless and stunning look. 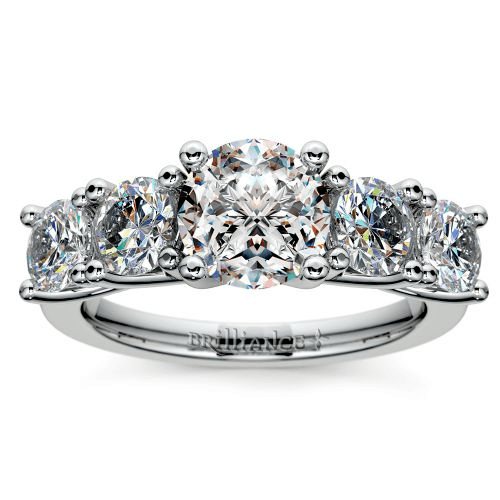 Now, will you opt for more diamonds to accentuate that halo or just a simple notched curving band? You can also pair the halo with a curved band that features emeralds, rubies or sapphires. 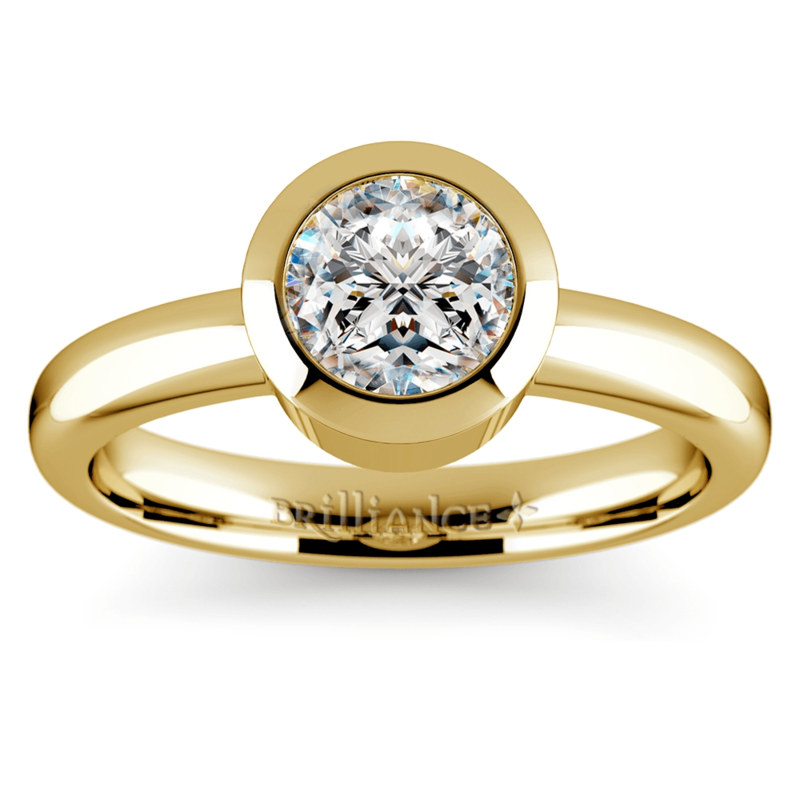 Solitaire style engagement rings are classic for a reason. These rings match almost any wedding band. You can pair solitaires with big and bold eternity bands with hefty carat weights, pave diamond bands that offer a delicate twinkle, gorgeous channel-set gemstone wedding bands or just a classic band in a matching metal. Solitaire engagement rings are the perfect blank canvas! There is, however, one solitaire style exception: the bezel-set solitaire. Bezels are a bit unique, and look best with domed or flat wedding bands. Bezel solitaires also look fantastic with wedding bands that are set with more bezel set diamonds or stones. Bezel settings are often constructed in a way that – like halo engagement rings—does not always pair seamlessly with every wedding band design. Although, some women might not care that rings don’t pair perfectly, as it is yet another individual style choice. Reese Witherspoon’s diamond engagement ring from Jim Toth doesn’t fit seamlessly with her bands. 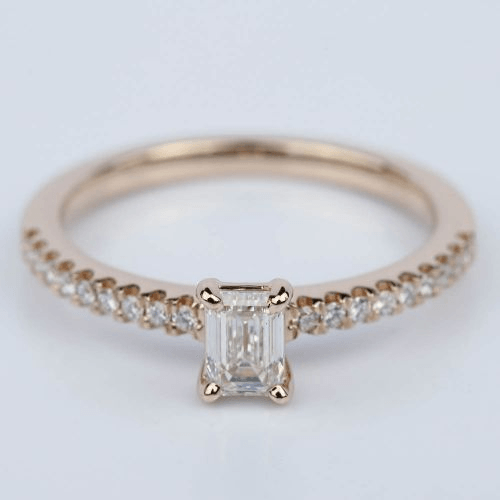 Her hefty Ashoka cut diamond actually pushes against her bands…and Reese’s wedding set still rocks. Regardless of the wedding band you choose, the meaning of the ring is what really matters. The engagement ring might be the centerpiece of the left hand, but the wedding band is the soul of the set. Your wedding band represents an unbreakable bond, a lifetime of love and perfect promises sealed with lasting Brilliance.